I'm using it for my blog. however the date doesnt appear and the post comment link doesnt work, can u teach me how to rectify this? i don't know how to download it! I love this template, I'm using it for my blog. But as some other people already mentioned, the date of posting is not showing. How do I make this right? but the dated doesnt workt out... i also dont how? I actually read somewhere that you should change your timestamp format(under the settings tab, under formatting) to "Friday, November 14, 2008". this is great site ! but how do u change the ABOUT part? I can't find it in the HTML code. I like this 1 only the date can you tell me how i can fix this? Awesome skins! But I have to ask: can I insert in one of this skin my personal banner???? This one is really royal. Very very cool ! http://games-database.blogspot.com do you like this teample ??? This template rocks! I really love the swirly images. Very feminine looking! i cant use the template. help! 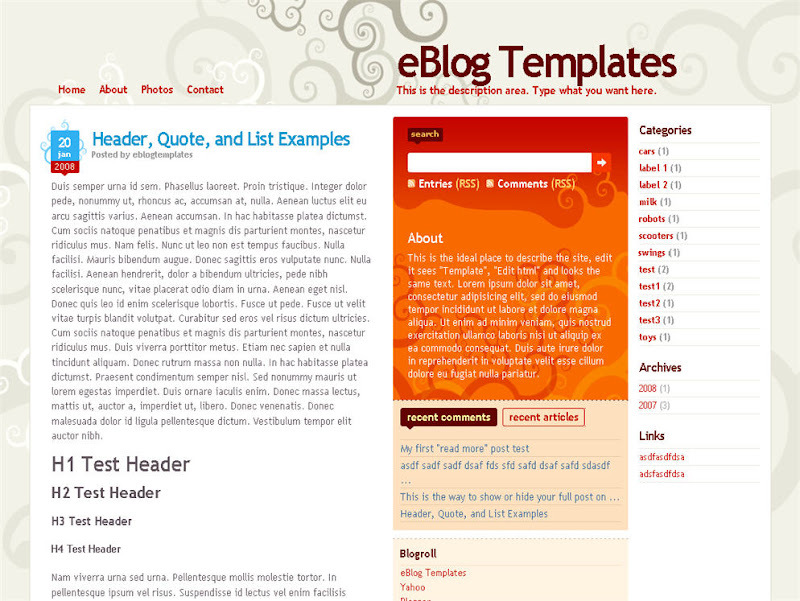 How do you put the new template on you blog?? I downloaded one and it wont' work!! Help me. look at my bLOg,you'll get more knowladge,key!!! Oh very nice skin... I Love This Blog.. But Template of this blog looks some kinda Extremely Simple.. My Blog also has a simple look.. But if u go inside it than its a different story to tell as its very complicated..
Nice, thank you. Had to translate some parts into German though. To fix the date stamp you must change the "Timestamp format"
and not the DATE HEADER FORMAT. nice template but there is a problem on the 17intches screen, it goes left with a huge white on the right making it really ugly. How can we put all of the template on the center? I really appreciate this piece of art creation. It seems very ideal. I salute the originator of this work. Thank's for this templates. I take it for my blog. i hope any template blog next. Ahh! I finally got it! I hafta revert to the classic template first..
VISIT http://www.jakasoffers.com for discounts & offers on apparels, footwear, perfumes, laptops, computers, refrigerators, washing machines, tour&travel packages,etc. and we will to link with "READ MORE" for fully article to your blog! Benefit, make a many linkback and get more traffic! All this is nice, but it is difficult if you do not speak English. I am French and can not display the date, as many above. Can anyone help me, please? This is a very beautiful piece of work..that's why I've tried my best to install it - gosh! hard for lay man like me to apply it. Luckiy after reading the comments, I finally managed to use this template!! Thanks guys...but one more thing - the comments link seems does not functioning....I saw one person raised this up but no one answer it.. help please!! I love this template but I'm having the same problem as the poster above with comments - can anyone help? please help me date is coming !! And i didnt understand from the post of shafri! very good template my friend. The bandwidth for the backround has been exceeded on your Photobucket account. How do you change the about text I can't find it in the html code? Thanks for the help with the date! This is a nice generous website! The designs are actually good! hi! nice works. i'm currently using this. but why don't the dates appear? i glad if yousee my blog!thanx! it show like this..... how to solve ? Herewith i want to announce that we are coming with our portal - www.made-from-india.com. Ours is an innovative and comprehensive online business-to-business (B2B) portal, It gives us an immense pleasure to introduce the much awaited complete business solution services i.e. made-from-india.com for the first time in India to esteemed organization like your’s. thx for the great template!! i finally managed to load it after many hours... i am trying to add an extra space above or below the header using the method of changing maxwidgets from 1 to 4 and 'showaddelement' from no to yes but then it says changes cannot be saved because more than one widget has the id LinkList1. Please help! i want to use it, but the blogger can not set it in the html part. what the best way to use this template? Hello! I love thir template, and I would like to use it. But would liked to make some changes but I don't know how it makes. Could you help me? Many Thanks, really nice template! Seems nice, will try it out! Go to SETTINGS -> FORMATTING -> TIMESTAMP FORMAT (Saturday, January 31, 2009). Having the same problems centering the template. Also, the recent posts and comments section isn't showing up. Anyone else having that problem? Great template though, I love it. Thanks so much! Hi everyone, i have question. i like this theme ..
Just used this as the new template for my blog (http://vaobep.blogspot.com/) I really just began using blogspot but I followed the directions given above and could still changed the templates :D yay yay Thanks so much !!! what should i do can u help me out? I am using this template too, it's nice! I am trying to use this template and am having trouble applying it to my blog, I can get the basic design to come up but it;s like one big mess... does anyone know where I can find a step by step set of instructions? Oh, I forgot about one thing. In my original blogs the date isn't showing in the beautiful designed blue/red thingie. How can I manage this? Hi, I just love this template, and try but have the same problem that Erik and jmf did. Today your Alexa ranking is 49,631. You are blog is incredible. Great templates and a new YOUTUBE high definition conversion. Visited the site after a long time. Keep on making those Wonderful FEEL GOOD templates. These videos may be help for your visitors. MAS BAGEMANA CARA PAKE TEMPLATE NYA MAS TOLONG YA! can somebody please help me and tell me..how can i make other pages on my blogspot?...you know...with home/about me/photos....etc...is it possible? I love your templates.. best site I have found. You have got some excellent templates here... I have installed one for my blog. Thanks for sharing. I am using very nice template. Thanks! Seo thx man nice template. 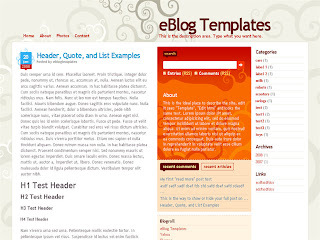 This is really beautiful templates, I downloaded it for my blogs. My post's link doesn't work! how can i fix it? but still not working.... What can i do? merhaba siteniz çok güzel olmuş benim sitemle link değişimi yapmak istermisiniz. sadece blogspot adresli linkleri eklemeye çalışıyorum. www.sitekayit.blogspot.com adresinde linkleri ve gerekli bilgileri bulabilirsiniz. I can't get this to work on my blog. Something about b:widgets? problem to set up, help me. Hi, I'm new in changing or using blog templates. I love this one, but I do know how can I change the template of my blog in blogger.com... could you give instrucions please... I appreciate your help. Some of us are trying to install it, follow the instructions but either recieved parsing problem or a jumbled blog. Doesn't work for me. Tried it so many times. I keeps coming up with errors. xtoxicx@hot.ee , send it to me, please. mine's not working either...dunno how to use the html thingy as im very new to blogging.need help plz. Wonderful design! Thank for sharing. very nice i personal made it more simple, even that it match with showing my photo works. I'm getting an error when I try to edit the html. I've copied the error below. Any ideas how to fix it? Wordpress and Joomla Premium Template for Free !! Great website love the design. if u wanna see how this template looks !? "The new widget id "Recent-Posts-Widget1" is invalid for type: Feed"
Wonderful, very useful thanks .. I tried using this template but when I copy and paste this in blogger, it gives me errors for all widgets saying that the type for each is invalid.